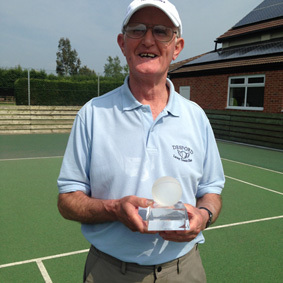 Following Harry Matty’s success in winning the Leicestershire LTA Volunteer of the year award in March 2016, he then went forward to the Regional LTA awards. We are delighted to report that Harry went onto win the Regional LTA Volunteer of the Year award and was the unanimous selection of all the judges in the process. 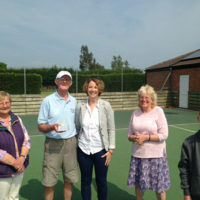 The LTA Head of Region for tennis in the Midlands, Claire Brown, said “It was Harry’s enthusiasm and commitment that made him stand out from all the entries selected from 440 tennis clubs in the region!” Claire Brown came to SiD on the morning of 28th May to present the Midlands trophy to Harry in person. She added that in the following national competition Harry was highly commended, eventually coming second to the final winner across the whole country. 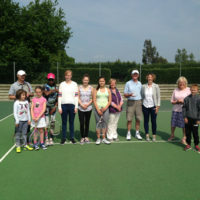 Claire Brown spent over an hour with members of Desford Lawn Tennis Club and was hugely impressed with both the atmosphere in the tennis club and in the approach taken by SiD to make our facilities as widely open to as many people as possible. She offered valuable advice on new funding streams from the LTA to support grass-roots developments such as that at SiD.